At a recent TechTalk at my employer I gave a presentation about Sitecore. 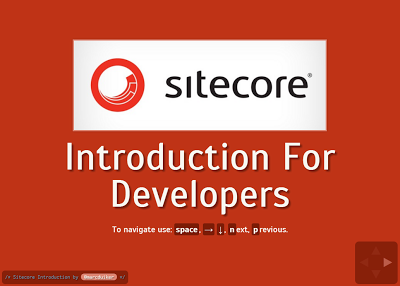 The presentation was targeted towards developers who have no experience with Sitecore whatsoever. I had 30 minutes to explain and show what Sitecore is and that was the biggest challenge of the presentation, there is just too much to tell! Next time I’ll focus on one topic and go more in depth. The HTML5 presentation is made with reveal.js and I’ve uploaded it to Azure using Dropbox (super easy!). Have a look and feel free to share and reuse it!